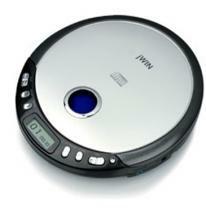 Take your music with you everywhere with this portable CD player. Automatic power-off function 3.5mm stereo headphone jack Runs on 2 "AA" batteries Liquid crystal display Memory for 20 audio tracks. Playable media: Audio CD (CD-R) Width: 5.6" Height: 1.1" Depth: 6.1" Imprint Area: 1.5`` x 2`` left or right.